This is like my fall back recipe. It’s my – hello I have no more creativity juices when it comes to food but want something spicy and that vaguely reminds me of home. Which is why during my undergrad I would make this every week and just keep it in the fridge. It’s kind of nutritious and tastes fairly good. It’s also cheap and doesn’t spoil easily. Oh yeah – you WANT this. Heat the oil in a medium sized pot over a medium low flame. Brown the onions. When done add the ginger garlic paste and fry until brown – keep a close watch because it burns easily. When brown add the curry powder, chilli powder, jeera powder and garam masala (henceforth referred to as masala). Stir vigorously until cooked (oil will ooze out a bit). If necessary add more oil. Add chickpeas and stir until the masala is even distributed. Add 1 cup water. Cook for 5-10 minutes. Mash approximately 1/3 of the chickpeas mixture with the back of your spoon (this will act as the gravy). Add the tamarind juice. Cook until it boils. Add the diced tomato. Cook until the tomato is cooked (mushy-ish). Add ketchup. Add salt, stir and you’re done! Serve with rice or some other carb equivalent. 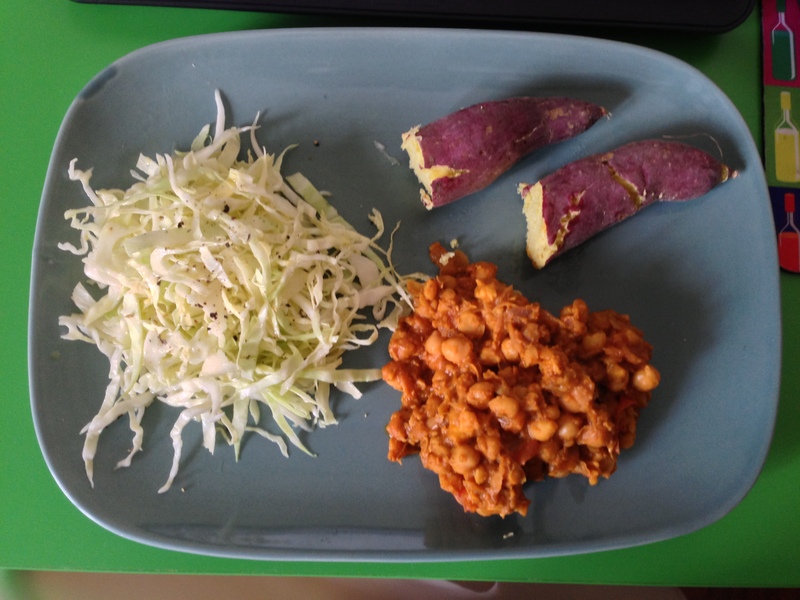 Here I ate it with baked sweet potatoes and a cabbage salad. YUM. Disgustingly healthy stuff. This is superb Dini, I’m sure it’ll turn out as tasty as it looks.